2019 has just begun, but before we really sink our teeth into the new year, we thought we would take a look back on the best looks and styles from the last year. Here’s our round up of the best 2018 design trends. This style was all about bringing the magical, inviting, nighttime woodland into our homes. The designs were dominated by intense, rich hues of berries, bark and bramble, including colours like reddy plums, orangey-brown rusts and navy-purples. This created an inside forest wonderland that channelled the inviting moody, magical midnight forest of A Midsummer Night’s Dream, as opposed to looking moody and threatening. Warming, rich tones can be softened with subtle lilacs and neutral greys to create a cosy design scheme. Accentuate the warmth and comfort of this look by layering up your interiors with woven chunky knits like blankets and throws, rustic country linens and hand-hewn wood. To add to the magical wonderland element, use animal prints of friendly woodland creatures in quirky designs – adding a modern, playful feel. Channelling the glamorous interior design trends of the fin de siècle that favoured everything luxe, this style brought modern decadence back into the home. Wallpaper saw a revival as mesmerising bold colours and indulgent designs became the new feature on our walls. This was carried into the kitchen with the help of bold statement colours that lend prominence to rich tones of blue and green. These deeper, more intense colours added greater depth to the space without being overwhelming. From landscapes to colourful geometric patterns to pre-Raphaelite style florals, wallpapers are an easy way to create a feature wall without the need for artwork or eye-catching furniture pieces. Japanese interiors featured heavily in 2018, with rich silks, graceful birds and Asiatic prints being a constant undercurrent in design. Embracing the maxim that more is more, 2018 saw a revival in decorative rugs, statement minimalist lighting and rounded furniture like curved coffee tables and puffy chairs inspired by Art Deco design. Luxury materials such as brass, marble and velvet are increasingly used to add a level of soft elegance to the overall design, accentuated by tones of dusty rose, ochre and burnished gold. Incorporating timeless materials such as marble coffee tables that can be softened with pink and green tones oozes classical-modernity. Scandi-inspired interior design continued to hold strong in 2018. This minimalistic style remained effortlessly stylish but was updated with an internationalist flair to keep it modern. 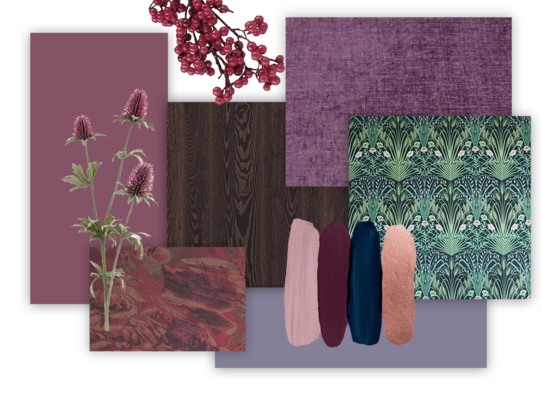 Global-inspired patterns and colours in rich earth tones and gentler palette of lavender, sage, blush pink and creamy whites were integrated into accessories and furniture. Layering up different textiles were used to give the look depth, from Moroccan leather ottomans to Ikat print fabrics, creating a textured, cosy space. Smaller features like dinnerware were brought into the mix by selecting pieces that looked more distressed to convey a hand-made aesthetic. Natural elements helped spaces look more authentic and down to earth. Woods like ash and stone elements including pebbles, granite, marble were integrated to give a more stripped-back feel that harmonised with more detailed features. 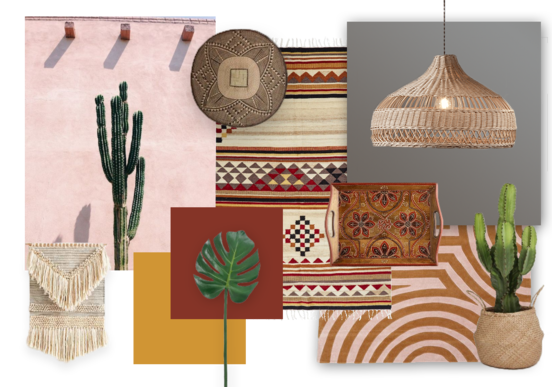 A design- journey exploration into global eclecticism, this trend was a vibrant celebration of patterns from around the world. Fusing different elements to create a lively blend of colour and texture. These patterns were balanced with rich earthy tones like ochre, umber and spiced red blend through rugged, woven textures. Hand-dyed textiles in rich earthy pigments and earthenware conveyed the craft-focused itinerant nature of the nomadic style. Plush soft furnishings were used to add flourishes of detail, integrating tassels, pom poms and macrame. While textured plants and succulents from around the world were used to bring the great outdoors inside to reflect the transient nomad lifestyle. Embracing the DIY and the perfectly imperfect, this style celebrated the beauty of craftsmanship. Natural wood, simple textiles and the imperfect sculptural forms of rattan and wicker were used to integrate imperfect yet stylish finishes. Staying with the simple and natural, this aesthetic channelled neutral colours like pale greys, oatmeal, charcoal black and oxidised red to mimic earthy shades found in nature. Focused on creating a calm backdrop, livened up with pops of colour to create interest without being too loud. Tactile fabrics and textures added an authentic, homely feel to the style while keeping with the simple, artisan feel. Inspired to create a beautiful home? Unsure how to start? The Extreme Design team are here to help. Visit one of our design studios and discover how we can help you design your dream home.